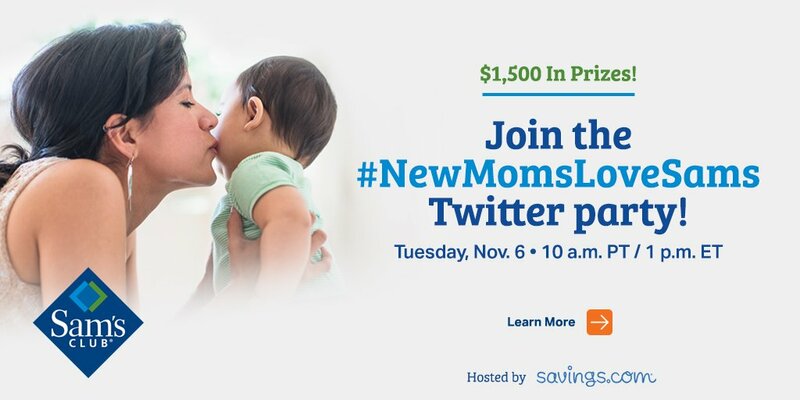 Join me for the #NewMomsLoveSams Twitter party that will be taking place on November 6th. During the Twitter party, there will be $1500 of memberships given away! Thank you to Savings.com for sponsoring this post. Being a new mom can be stressful but let me help you take some of the stress out by giving you some great mom advice and chances to win Sam’s Club gift cards at a Twitter Party next week! Scroll down for all the details… you aren’t going to want to miss this! Make plans now to join me on Tuesday, November 6th at 10 PM PT/1PM ET. Be sure to RSVP here! I am also excited to tell you about a fun giveaway on Savings.com. Now you enter to win one of 25 $100 Sam’s Plus Membership Gift Cards! Hurry this Giveaway ends of Friday, November 9th. CLICK HERE TO ENTER! Now is also a great time to grab a membership to Sam’s Club because you will receive a $20 gift card, as well as $25 in new member instant savings! Just head to the Sam’s Club New Moms page on Valpak.com and you can sign up for a new membership and find information on all the great offers currently available.